We were interviewed by the French newspaper 20minutes about the three wise monkeys. If you want to read the original French version, click here. If you prefer to read the (not perfect) Google translation, click here. The list of items with three no evil monkeys seems endless. Did you know that no evil monkey pencil sharpeners exist? More…..
How Jason McHenry in California got involved with the Three Monkeys can be read in his Collectors Portrait in our Collectors Gallery. If you want to read stories of other collectors too, click here. A just released documentary movie about three friends travelling across Europe, taking it in turns to go without speech, hearing and sight. Each week the roles are changed. More…..
Three monkeys produced with 3D printing are slowly entering our collector’s world. The Picture for December shows a 3-monkey set owned by a fellow collector in Switzerland. More…..
Definitely not our world, but we have to report about it. Here is a picture and here is a “consumer report”. Explanations of the three-monkeys adage. More….. Fellow collectors Gerry and Tabitha Blevins from Texas were featured with an interesting article about their collection and photos in the Palestine Herald of November 1, 2016. To read the article, click here. We received news that the world-famous woodcarving of the three monkeys in Nikko Japan has been removed for restoration works and is not available for the public until approx. March 2017. Please adjust your travel plans. Halloween: Hear no evil, see no evil and speak no evil. More…. More information will be published in this website, as soon as available. Because of a last-minute date change, the attendance of the 2016 three-monkey meeting in Belgium was slightly below expectations. 26 participants were welcomed by both the mayor and the tourist counselor of Riemst and enjoyed a very pleasant and well organized day. Many thanks to Isi & Jean Marie Hertogen and family. More….. If you have sufficient time, it may be a good idea to visit Joellen Deckers website. A very colorful presentation of figurines and pictures representing hear, see and speak no evil. More….. Hear, see and speak no evil angels/cherubs, instead of monkeys, seem to be very popular. Here is a small selection. More….. Daredevil, Spiderman and Deadpool as hear no evil, see no evil and speak no evil. More…. but maybe you have seen funnier ones? Also rabbits, hares or bunnies do “hear no evil, see no evil and speak no evil”. Here is a small selection of figurines. More….. In a quiet moment some of us may have pondered over the fact whether collecting is just a hobby or a more a kind of mental disorder. Psychology Today has the answer. As far as we can judge, we are all more or less safe! More……. Just mark your calendar now already. Here is a list of possible sightseeing in Kansas. More…..
A postcard from 1905 with three no evil women. More….. Photos and a report about this event by organizer Gregg Ottinger. More…..
A funny no evil picture received from Bruce. More…..
One of our frequent website visitors, Chikako, made this nice photo in a shop in Cologne, Germany. More….. The no-evil symbol doesn’t stop for chicken and eggs. Just have a look. More…..
With only 10 weeks to go, it is time to think about registering for this nice event. Here are the details. More…..
Over 200,000 people have been spending time and energy to discuss whether the 3 monkey emoji’s are one or three monkeys. Although we appreciate everything that pays attention to the three wise monkeys, this is not exactly our world! A different view on the three wise monkeys in a very old children’s book. Even a Katana Samurai sword exists with the three wise monkeys. More…..
An article in a German newspaper compares cell phone addicts with the three monkeys. “Hear See and Speak No” (with photo). Here is a Google translation. More….. If you prefer to see the original text, click here. Although we don’t understand a word from what is said, it is interesting to see how the no evil symbol is used for promoting this store. More…..
Space Chimps - three NASA chimpanzees are sent to a faraway galaxy to find themselves on a strange, uncharted planet, where they embark on a fantastical journey to save its inhabitants from a tyrannical leader. More….. If you ever win the lottery or hit the jackpot, here are a few suggestions. More….. and more…. If you want to know more about Japanese monkeys and their influence on culture and religion in that country, here is an interesting article. More….. There is an unexpected problem with the date. A huge bicycle sport event, originally planned for August in Riemst, has now been moved to September 24, exactly the date that is foreseen for the 3-Monkey meeting. The organizers are working hard for a solution, but it looks inevitable that the date has to be changed to one week earlier or later. More news to follow in this website. In Facebook the Police of Munich, Germany is responding to allegations, that they are not always reporting the truth. The Facebook entry shows three officers that hear no evil, see no evil and speak no evil. More….. Here is more information about this event including daily events and hotel details. More….. In Hinduism Ganesha is the God of wisdom, knowledge, new beginnings and remover of obstacles. Now Ganesha is also performing hear no evil, see no evil and speak no evil. More….. Tomorrow, March 31, 2016 our website will be 9 years old. That does not sound like a lot, but it still is not too bad, considering that the worldwide average lifespan of a website is 2-4 years. We would like to use this opportunity to thank all of our website visitors and especially those who have contributed by sending us interesting information and entries for the Guestbook. Since 2011 a traveling exhibition with photos of almost 1500 people acting like the three wise monkeys is moving around in Massachusetts USA. Here is the website about this project with information about past and present exhibitions. More…..
David and Le from Australia love to travel all over the world and among other things, to search for three monkey figurines. Here is their website with their three-monkey collection. More….. In an earlier entry we mentioned that the Year of the Monkey inspires many artists to create new three wise monkey items. Here is an example. More…. A 70 years old advertisement for Canadian Dry featuring the three no evil monkeys. More…..
Just see and read for yourself about the design “the dance of the deaf and dumb eye” by Danish designer Nikoline Liv Andersen. More…..
We received many reactions and photos to our message of January 25 concerning the African masks page so that we were able to add seven more pictures. If you want to see them, the additions are at the bottom of the page. More…. 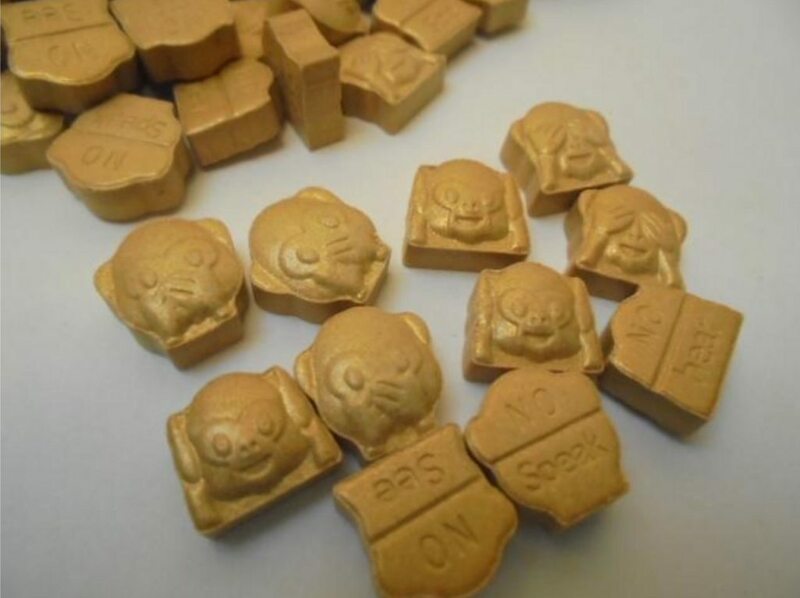 During these years often special no evil monkey items are being produced, so keep your eyes and ears open. No one ignores the Marauder. Gibson advertisement of 1975. More….. If you want to see our other Pictures of the Month, click here. No Evil Monkeys on top of a wooden mask are often one of the highlights of a three wise monkeys collection. Such masks usually originate from Africa and can be as high as 3 feet. Here are some examples. More…. More news will follow, as soon as available. We received a request from the Shiota technical high school in Ureshino City, Japan to use photos from our Japanese website for their monthly newsletter. Their management letter was dedicated to 2016 the Year of the Monkey. Of course we granted permission and here is the result. The author added some comments for us in English. A computer translation of the Japanese text is to be found here, but it shows again that for us, such translations are extremely difficult to understand. As in most years on January 6 (Epiphany) we report about new no evil beans for the traditional Three Magi Cake. To be viewed at the bottom of this page. 10 different models with each the three no evils back to back in one figurine. Also on the same page is a link to an explanation of this custom. For earlier issues of this News Bulletin see the archive in the left column, click here. We cannot accept any responsibility for the content of this or for external websites accessed via a link in this homepage. All information in all pages of this website and all published links have been carefully reviewed and compiled. The provider of the website to which published links lead is solely responsible for any illegal, erroneous or incomplete content and for any losses or damages arising out of the use or non-use of that information. No liability will be accepted by the party which merely refers to such a website via a link.